1050A Outdoor "All Weather" Digital Entry Keypad Discounts Apply ! 1050X Outdoor "All Weather" Digital Entry Keypad Discounts Apply ! Additional Battery for Battery Back-Up Kits 12V / 7Ah Discounts Apply ! 16111 Car Stop 6' Park-It Car Stop Striped Yellow Discounts Apply ! 212LS Electronic Access Control Cylindrical Lockset Discounts Apply ! 26111 Striped Yellow 6' Recycled Rubber Speed Bump Discounts Apply ! The rubber speed bump reduces vehicle speeds making parking lots safer for pedestrians and motorists. Constructed from 100% recycled tires, the speed bumps are preformed to implement immediate installation. The flexible design conforms to the contour of virtually any road surface. 6062-HPB4SQHB-DS150IKIT Handicapped Access Control System With Wireless Exterior Entry Button Discounts Apply ! The Model 6062-HPB4SQHB-DS150IKIT Access Control Kit includes an Altronix 6062, Bosch DS150i, HPB4SQHB Square Blue Illuminated Handicap Push Button, 12 Volt DC 2 Amp, UL Listed Switching Power Supply, 10RD433 Receiver and a 10EMR4751 Round Push Button Exit. 78LM Multi-Function Control Panel Discounts Apply ! Liftmaster 825LM Remote Light Control Discounts Apply ! 829LM Garage and Gate Monitor Discounts Apply ! Liftmaster 888LM MyQ Control Panel Discounts Apply ! Liftmaster 888LM MyQ Control Panel w/ 825LM Remote Light Control Discounts Apply ! Liftmaster 888LM MyQ Control Panel w/ 829LM Garage and Gate Monitor Discounts Apply ! Liftmaster 895MAX 3 Button Premium Remote Control Discounts Apply ! FAAC 950N2-10RD-10EMR Handicapped Access Control System Electric Door Opener Kit With Articulating Push Arm Discounts Apply ! Aegis 7150 FFP Full Flush Mount Telephone Entry System Discounts Apply ! The Aegis 7150 SM - Surface Mount Telephone Entry System grants access to up to 150 users and up to 150 access codes. Aegis 7150FFP (Full-flush) Telephone Entry System Discounts Apply ! The Aegis 7150FFP (Full-flush) telephone entry system grants access to up to 150 users and up to 150 access codes. Aegis 7150P (Surface Mount) Telephone Entry System Discounts Apply ! The Aegis 7150P (Surface Mount) telephone entry system grants access to up to 150 users and up to 150 access codes. Aegis 7150 SM - Surface Mount Telephone Entry System Discounts Apply ! Aegis 7250FFP (full-flush) Telephone Entry System Discounts Apply ! The Aegis 7250FFP (full-flush) telephone entry system grants access to up to 250 users and up to 250 access codes. Aegis 7250P (surface mount) Telephone Entry System Discounts Apply ! The Aegis 7250P (surface mount) telephone entry system grants access to up to 250 users and up to 250 access codes. Aegis 8250FFP (Full Flush) Telephone Entry System Discounts Apply ! The Aegis 8250FFP (Full Flush) telephone entry system grants access to up to 250 users with remote software and 250 access codes. Aegis 8250P (surface mount) Telephone Entry System Discounts Apply ! The Aegis 8250P (surface mount) telephone entry system grants access to up to 250 users with remote software and 250 access codes. Aegis 92KCR35FFP (Full Flush) Telephone Entry System Discounts Apply ! The Aegis 92KCR35FFP (Full Flush) telephone entry system grants access to up to 2,000 and 3,500 cards and codes. Aegis 92KCR35P (Surface Mount) Telephone Entry System Discounts Apply ! The Aegis 92KCR35P (Surface Mount) telephone entry system grants access to up to 2,000 and 3,500 cards and codes. Aegis 9600CR25FFP (Full Flush) Telephone Entry System Discounts Apply ! The Aegis 9600CR25FFP (Full Flush) telephone entry system grants access to up to 600 and 2,500 card and codes. Aegis 9600CR25P (Surface Mount) Telephone Entry System Discounts Apply ! Aegis AHP5 Heating Pad Discounts Apply ! Aegis AHP5 Heating Pad for the Aegis 7000, 8000 and 9000 series telephone entry systems. Aegis AVP7 B & W Video Camera Discounts Apply ! Aegis AVP7 B & W Video Camera for Aegis 7000 series telephone entry systems. Aegis AVP7C Color Video Camera Discounts Apply ! Aegis AVP7C Color Video Camera for Aegis 7000 series telephone entry systems. Aegis AVP8C Color Video Camera Discounts Apply ! Aegis AVP8C Color Video Camera for Aegis 8000 series telephone entry systems. Aegis AVP9 B & W Video Camera Discounts Apply ! Aegis AVP9 B & W Video Camera for Aegis 9000 series telephone entry systems. Aegis AVP9C Color Video Camera Discounts Apply ! Aegis AVP9C Color Video Camera for Aegis 9000 series telephone entry systems. Aegis UVPC B & W Video Camera Discounts Apply ! Aegis UVPC B & W Video Camera for Aegis 8000 series telephone entry systems. Aiphone LEF3L Call Semi-flush Master Station Intercom Discounts Apply ! The Aiphone LEF-3L is an intercom master station with that can hold a total of 4 intercoms. Any combination of subs and masters can be used up to its maximum capacity. Aiphone LE-D Surface Mount Door Station Discounts Apply ! Aiphone LE-D is an ABS plastic door station which is surface mount. It mounts to a single gang electric box and is weather resistant. Provides communication as well as call-in features. Albano One Channel Receiver Kit - Trinary ALB-R1 Discounts Apply ! Albano Two Button Transmitter - Trinary ALB-T2 Discounts Apply ! Albano Two Channel Receiver Kit - Trinary ALB-R2 Discounts Apply ! Albano One Button Transmitter - Trinary ALB-T1 Discounts Apply ! Altronix 6062 Timer Module 12/24VDC Operation Discounts Apply ! American Access Systems AAS 16-1050 Wireless Telephone Entry System Discounts Apply ! Apollo 936i Vehicular Gate Control Board Discounts Apply ! Nice Apollo Swing Gate Motor Operator Control Board 936US / 936 ETL Discounts Apply ! Replaces the 835 & 836. This board requires a PHOTOCELL to work. Please add photocell in the options section. APL-EPMB Photocell Discounts Apply ! The APL-EPMB Medium photocells are part of the Nice Era mid size photocells offering. The APL-EPMB model uses Nice BlueBUS Technology to enable an easy connection to the control unit of all compatible devices with only two wires. Nice APL-INTI2/A-BK Remote Control Transmitter Discounts Apply ! APL-MOFB BlueBUS Photocell Discounts Apply ! This item is discontinued. Please see model APL-EPMB as a possible alternative. The APL-MOFB photocells are detectors (type D according to EN standard EN 12453) which can be used for automation of gates. They reveal obstacles situated on the optical axis between the transmitter (TX) and receiver (RX). Apollo 1500 Swing Gate Opener (also known as a Apollo swing gate operator or Apollo swing gate motor) is for swing gates up to 16', 600 lbs. and now includes a built in receiver. Easily installed on most existing or new swing gates, Weather resistant, 12V DC battery, solar or AC rechargeable with a 2 year warranty. Apollo gate openers are one of our best sellers. Apollo 1600N Dual Swing Gate Opener (also known as a Apollo swing gate operator or Apollo swing gate motor) is for gates up to 16ft & 600 lbs. each leaf and now includes a built in receiver. Apollo swing gate openers are ready for installation upon receipt. A professional installer is recommended. Some welding is required for proper installation. We are proud to offer Apollo gate openers. Apollo APL-951N Wireless Keypad Discounts Apply ! Apollo Nice LBar Barrier Gate Discounts Apply ! Apollo Nice M5Bar Barrier Gate Discounts Apply ! ASE-1000KPWRVR Post Mount Digital Keypad With Temporary Code Feature & 1000 User Codes Discounts Apply ! Model 1002G LZ Bracket Set For Our Gate Lock Model CE1200LSWR Discounts Apply ! ASE-100MINIMAG Miniature Magnetic Lock 100 lbs Holding Force Discounts Apply ! Model 1012G L & Z Bracket Set Discounts Apply ! Model 1051 Lighted Keypad With Intercom Station Discounts Apply ! OUR 1051 INTERCOM KEYPAD IS A QUALITY OUTDOOR STATION WITH INTERCOM CAPABILITY. FAS 10EMR4751 Wireless Commercial Round Handicap Exit Button Discounts Apply ! 10RD-10EMRkit with Model 10RD433 Digital Receiver and Model 10EMR4751 Round Push To Open Handicapped Wireless Commercial Exit Button Discounts Apply ! 10RD433 Programmable 433 Mhz Wireless Digital Receiver Discounts Apply ! FAS 110PB Push Button Request To Exit Discounts Apply ! Complete 1200 lb Magnetic Lock Wiegand Output Keypad Kit With Report Capabilities Discounts Apply ! Use PIN Numbers to gain access to your building or let a receptionist buzz visitors in! Then simply push a button to exit. The 1200MagACPELEKit1 includes a heavy Duty Magnetic Lock with 1200 lbs. Of Holding Force, 1 Illuminated Exit button, 1 Receptionist button, 1 Transformer/power supply, 1 Securakey ACPE-LE Control Panel with SecuraKey KPS-SA Digital Keypad and 1 SecuraKey SK-24VDC 500 Ma plug-in Power Supply. All Magnetic Locks Include Armature Plate & Mounting Hardware For Basic Out-swing Applications. Model 12VDC7ABUP Battery back-Up System For Magnetic Lock Discounts Apply ! Battery Back-Up System For Magnetic Lock. Includes Battery, Switching Board, And Transformer. Workable system for 6, 12 & 24VDC! Model 1300GF Single Door Flush Mount Magnetic Lock With 1300 lbs. Holding Force For Inswing Indoor Applications Or Outswing Applications Discounts Apply ! Model 1300GS Vehicular Gate Lock with 1300 lbs. Holding Force Discounts Apply ! Model 160S Fail Secure European Style Electric Strike Discounts Apply ! Model 160S Fail Secure European Style Electric Strike. Model 2000 Surface Mount Automatic Sliding Door Magnetic Lock With 300 lbs. Holding Force Discounts Apply ! Model 2000-Slide surface mount magnetic lock for sliding doors with 300 LBS. of holding force. Surface mounted with built in spike suppressor. CE approved! All Magnetic Locks Include Manual, Armature Plate & Mounting Hardware For Basic Out-swing Applications. 200SLD Electric Dead Bolt Discounts Apply ! 200SLD Electric Dead Bolt Buy 3 Get 1 FREE Discounts Apply ! Special Offer Price While Supplies Last "Buy 3 Get 1 Free"
ASE-2600SHEARLOCK Shear Lock Magnetic Lock With 2600 LBS. Holding Force Discounts Apply ! This is Model ASE-2600SHEARLOCK shear lock. Has an Approx. holding force of 2600 lbs. with a built-in time delay feature. ASE-2x800MAGD Double Door Magnetic Lock Holding Force 800 lbs Per Side / Total 1600 lbs Discounts Apply ! ASE-300NCB Fail Safe Electric Strike Discounts Apply ! ASE-300NOA Fail Secure Electric Strike Discounts Apply ! 310R 310 MHz Receiver Discounts Apply ! ASE-313NC Glass Door Fail Safe Electric Strike Discounts Apply ! ASE-314NOADJUST Narrow Fail Secure NO Strike / Adjust Latch, Built in On / Off Switch Discounts Apply ! ASE-320ANCNO ANSI Standards Fail Safe/Secure Strike Default NO Discounts Apply ! ASE-320BNONC ANSI Standard Fail Safe/Secure Strike Default NC Discounts Apply ! ASE-350NCB Narrow Style Fail Safe Normally Closed Electric Strike Discounts Apply ! ASE-350NOA Narrow Fail Secure NO Electric Strike Discounts Apply ! Model 400GF Weather Resistant Surface Mount Single Door with 400 lbs. Holding Force Discounts Apply ! Model 400GS Weatherproof Pedestrian Gate Lock with 400 lbs. Holding Force Discounts Apply ! Model 501 Electromagnetic Door Holder Discounts Apply ! Model 502 Electromagnetic Door Holder With 110 lbs. Holding Force Discounts Apply ! Model 502 Electromagnetic Door Holder With 110 lbs. Holding Force. This electric door holder is UL listed and CE Approved. Model 503 Electromagnetic Door Holder With 110 lbs. Holding Force Discounts Apply ! Model 503 Extended Electromagnetic Door Holder With 110 lbs. Holding Force. This electric door holder is UL listed and CE Approved. Model 600LSDSDM Surface Mount Single Door Magnetic Lock with 600 lbs. Holding Force Discounts Apply ! Model 600LSDSDM surface mount single door maglock has 600 lbs of holding force and includes delay, monitoring, LED, Lock sensor, spike suppressor and is CE approved! Includes Manual, Armature Plate & Mounting Hardware For Basic Out-swing Applications. Model 701A Electric Strike Discounts Apply ! Model 701B Electric Strike Discounts Apply ! Model 705STRIKE Electric Strike Discounts Apply ! 705STRIKE Reliable and compact Electric Strike for wooden, steel and aluminum doors. Model 706STRIKE Electric Strike Discounts Apply ! 706STRIKE Reliable and compact Electric Strike for wooden, steel and aluminum doors. ASE-800MAGSTLED Single Door Surface Mount Magnetic Lock With 800 lbs. Holding Force Discounts Apply ! ASE-800MORTISE Mortise Mount Magnetic Lock 800 lbs. Holding Force Discounts Apply ! Model 803A COLOR Wireless Camera Discounts Apply ! Model 803A Miniature Wireless Color Camera with 380 TVL. Includes receiver and all the accessories you need to hook up to any Television with RCA connection (found on almost every basic television). Model ACC1200 Surface Mount UL Listed Single Door Magnetic Lock with 1200 lbs. Holding Force Discounts Apply ! Model ACC1200 is a surface mount maglock with 1200 lbs holding force for single doors. Features LED, lock sensor, built in spike suppressor, and is UL listed and CE approved. All Magnetic Locks Include Manual, Armature Plate & Mounting Hardware For Basic Out-swing Applications. Model ACC600 Surface Mount UL Listed Magnetic Lock with 600 lbs. Holding Force Discounts Apply ! Model ACC600 magnetic lock is a surface mountable magnetic lock for single doors with 600 lbs of holding force. Magnetic Lock Features include door monitoring, LED, lock sensor, built in spike suppressor, and is UL listed and CE approved. All Magnetic Locks Include Manual, Armature Plate & Mounting Hardware For Basic Out-swing Applications. Outdoor Camera Housing Discounts Apply ! AH25 Full size out door weather proof CCTV camera housing. APOLLO 1650ETL/N Swing Gate Opener Package With Two APL-INTI2/A-BK Remote Control Transmitters & Receiver and One APL-951N Wireless Keypad Discounts Apply ! This is the Apollo 1650 Swing Gate Opener (also known as a Apollo swing gate operator or Apollo swing gate motor) Package. This package includes: Circuit Board, 2 Actuators with 8 feet of cable for master actuator and 38 feet cable for slave actuator, 2 Mounting arms, Hardware, Battery box (Battery Not Included), Safety signs, Long Range Wireless Receiver (433Mhz), 2 Remote Control Transmitters (433Mhz) and One APL-951N Wireless Keypad. AU40B PTZ Control Box for High Speed CD55 Discounts Apply ! AU40E Mini Pan and Tilt Controller Discounts Apply ! B002L Mounting Bracket Discounts Apply ! B004 Mounting Bracket Discounts Apply ! B009 Mounting Bracket 5KG Aluminum Beige Discounts Apply ! Model B1002 L & Z Bracket Set For Magnetic Lock Model ASE-1300GS Discounts Apply ! BA10 Audio Cable with Amplifier Discounts Apply ! BCCAM Covert Baby Care Camera w/ alarm clock Discounts Apply ! Model BEL002 Electric Deadbolt Discounts Apply ! This is the model BEL002 Fail Safe Electric Dead bolt. This Electric Dead-bolt is uses the door's integral relay with access controllers or digital keypads. One Door Magnetic Lock Kit 600Lbs Hold Force With Key Switch & Exit Button Discounts Apply ! This Basic Magnetic Lock Kit System is designed and integrated to be used as a simple and easy to use access control solution for most 1 door applications. This package contains these items: 1 ASE-UL600LSDM Electric Lock, 1 ASE-12v1000amp Power Supply, 1 HPB21 Exit Button, 1 PB21k Entrance Key switch. Blue Guard bluetooth enabled stand-alone access control Discounts Apply ! Blue Guard recognizes Bluetooth enabled cell phones when they move into range, verifies the phone's unique ID and activates its output to the access control system. Up to 10 cell phones may be bonded with the Blue Guard for hands free access. 3 Piece BNC Male Crimp Type Connector Discounts Apply ! BNC male to RCA Female Adapter Discounts Apply ! BNC Female to RCA Male Adapter Discounts Apply ! Model BZ05 External Buzzer For Access Control System Discounts Apply ! CCTVCLOCK Color CCTV Covert Camera built in Clock Discounts Apply ! CCTVCLOCK covert camera with 1/4" Sony CCTV lens, 380 TVL, 1 Lux in a functional clock. CD35 Indoor Dome Camera Discounts Apply ! CD35IR Color 1/4" SONY CCD Dome Camera Discounts Apply ! CD35IR 8" Dome Color Camera with 1/4" CCD Medium Resolution 420 Tv Lines Indoor 0 Lux (10~20 feet) 23 Infra Red Illuminators Day & Night 12 Volts. CD35IR-SH24 Day & Night Indoor Dome Camera Discounts Apply ! CD35IR-VPW Vandal Proof Indoor Dome Camera Discounts Apply ! 35VPIR 1/4" IR CCD Color Camera Discounts Apply ! CD50 Dome Camera Housing Discounts Apply ! CD54W PTZ speed dome Camera Middle Speed Day & Night Discounts Apply ! CD66 Panning Outdoor SONY CCD Color Dome Camera Discounts Apply ! CD67 Outdoor PTZ Color Camera, 2x Digital Zoom Discounts Apply ! Model CE1200LSWR Vehicular Gate Lock with 1200 lbs. Holding Force Discounts Apply ! Model CE1625LSWR Indoor/Outdoor Heavy Duty Magnetic Lock With 1625 lbs. Holding Force Discounts Apply ! CG35H High Resolution Mini Camera Discounts Apply ! CHURCH ACCESS CONTROL KIT Church Access Control Kit Discounts Apply ! CM25WNV-SH20 Color Camera Discounts Apply ! CM25WNV-SH20/3.61/3" CCD COLOR CAMERA W/23 LEDS, 3.6mm LENS, 420 TVL and WEATHER PROOF HOUSING! Convenience Store Magnetic Lock Kit System With Battery Back-Up (1200 lbs Holding Force) Discounts Apply ! The Convenience Store Magnetic Lock Kit System With Battery Back-Up is designed to be used as a access control solution for a Convenience Store. This Kit Includes: 1200LB Magnetic Lock, 1 Magnetic Lock Buzzer, 1 Egress Button, 1 On / Off Permanent Key Switch, 1 433 MHz Long Range Wireless Receiver, 2 Remotes, 1 Battery Backup Box, 2 Batteries, Switching Control Board, 1 Transformer 16 VAC 40 Amp. Estimated Range is 150'+ line of sight. ASE-CP-3-100-5W Cartell GateMate Free Exit (Probe / Sensor) System Discounts Apply ! CPD252ZD 8 Channel MPEG4 Network DVR Discounts Apply ! CPD511 4ch mpeg4 Network DVR Discounts Apply ! CPD515ZD 8 Channel MPEG4 Network DVR Discounts Apply ! CPD517ZD 16 CH MPEG4 Network DVR Discounts Apply ! CPD531ZD 4 Channel MPEG4 Network DVR Discounts Apply ! CPD537ZD 16 Channel MPEG4 Network DVR Discounts Apply ! CPD537ZD 16 Channel MPEG4 Network digital video recorder. Double Door Gas Station Magnetic Lock Kit System With 1200 lbs Holding Force & Back-Up Battery Discounts Apply ! The Double Door Gas Station Magnetic Lock Kit System With Battery Back-Up is designed and integrated to be used as a complete access control solution for a Gas Station. This Kit Includes: 2 1200LB Magnetic Locks, 1 Magnetic Lock Buzzer, 1 On / Off Permanent Key Switch, 1 Long Range Wireless Receiver, 2 Remotes, 1 Antenna, 1 Battery Backup Box, 2 Batteries, Switching Control Board, 1 Transformer 16 VAC 40 Amp. Estimated Range is 150'+ line of sight. DP29SW-IM Door Strike Controller Discounts Apply ! Dual Height Pedestal With Base Cover - 42" / 72" Discounts Apply ! Retro Reflective Photoeye EMX NIR-50 Discounts Apply ! The NIR-50 Retro-Reflective Photoeye can be used as a reversing sensor for commercial overhead doors, gates and parking barriers. Model FAS-HCE600LSWR Gate Lock with 600 lbs. Holding Force Discounts Apply ! Gym Access Control Kit With 1200 lb. Magnetic Lock, Card Access System, 100 Card, Exit Devices & Power Supply Discounts Apply ! Model 1200LSDSDM Magnetic Lock with 1200 lbs. Holding Force Discounts Apply ! Model 1200LSDSDM is a single door surface mount magnetic lock with 1200 LBS of holding force. Features delay, monitoring, lock sensor, built in spike suppressor, and is CE approved! All Magnetic Locks Include Manual, Armature Plate & Mounting Hardware For Basic Out-swing Applications. Model H300C Mortise Mount Single Door Magnetic Lock with 300 lbs. Holding Force Discounts Apply ! Model H300C Mortise mount magnetic lock with 300 lbs. holding force for single doors includes a lock sensor and is CE approved! All Magnetic Locks Include Manual, Armature Plate & Mounting Hardware For Basic Out-swing Applications. Model H300HC Surface Mount 300 lbs. Holding Force Single Door Magnetic Lock Discounts Apply ! This is a 300lb holding force surface mount magnetic lock for single doors. Features lock sensor and is CE approved. All Magnetic Locks Include Manual, Armature Plate & Mounting Hardware For Basic Out-swing Applications. Model H600LSDMBZ Surface Mount Single Door with 600 lbs. Holding Force and Built in Buzzer!! Discounts Apply ! Model H600LSDMBZ is a surface mount single door lock with 600 lbs. of holding force and a built in buzzer. Features include delay, monitoring, built in LED, lock sensor, spike suppressor and a BUILT IN BUZZER! All Magnetic Locks Include Manual, Armature Plate & Mounting Hardware For Basic Out-swing Applications. Model H8TMINIMAG Miniature Magnetic Lock For Small Doors & Cabinets Discounts Apply ! Model H8TMINIMAG miniature magnetic lock is for cabinets and small doors. Provides 80 lbs. of holding force. Has lock sensor, time delay, and includes an L bracket. The Mini Mag Magnetic Locks Includes Manual, L Bracket, Armature Plate & Mounting Hardware For Basic Out-swing Applications. In-swing Door applications require Z Brackets. Model ASE-H-B1002 L & Z Bracket Set Discounts Apply ! Model ASE-H-B1012 L & Z Bracket Kit Discounts Apply ! Model LZ102 L & Z Bracket Kit Discounts Apply ! Model HL1022 L Bracket Discounts Apply ! FAS HPB21 Press To Exit Button Discounts Apply ! FAS HPB23K Stainless Steel Key Switch In Gang Box With Two Keys Included Discounts Apply ! FAS HPB3SQER Square Red Illuminated Push To Exit Button With Text "Press To Exit" Discounts Apply ! FAS HPB4SQER Square Red Illuminated Push To Exit Button Discounts Apply ! FAS H-PB4SQPG Square Green Illuminated Push To Exit Button Discounts Apply ! FAS HPBN01 Stainless Push Button Request To Exit Discounts Apply ! Model ASE-HS125SLD Electric Strike Fail Secure Discounts Apply ! Model ASE-HS125SLD NON Fail Safe (Fail Secure) "Medium Duty" Electric Strike With Lock Sensor. Voltage: 12VDC. Stainless Steel Keeper. Holding Force Estimated Between 1200 & 1400 lbs. Model HU185 U Bracket Discounts Apply ! IP Relay To Open Your Electric Lock Or Gate From Any Computer! Discounts Apply ! Jewelry Store Magnetic Lock Kit System With 1200 lbs Holding Force & Back-Up Battery Discounts Apply ! The Jewelry Store Magnetic Lock Kit System With Battery Back-Up is designed and integrated to be used as a complete access control solution for a Jewelry Store. This Kit Includes: 1200LB Magnetic Lock, 1 Magnetic Lock Buzzer, 1 On / Off Permanent Key Switch, 1 Long Range Wireless Receiver, 2 Remotes, 1 Antenna, 1 Battery Backup Box, 2 Batteries, Switching Control Board, 1 Transformer 16 VAC 40 Amp. You may choose 1 Request to Exit Button or Motion Sensor. Estimated Range is 150'+ line of sight. Outdoor Intercom and Keypad Set with Indoor Station Discounts Apply ! This Internal communication solution kit includes: Model 1051 Lighted Keypad Intercom, the Aiphone LEF3L Station Intercom, Aiphone AJ-RY-PA Relay, Altronix 6062 Timer and C2-15-12V2AMP Power Supply. Outdoor Intercom and Keypad Set with Indoor Station and a 42" Powder Coated Aluminum Gooseneck Pedestal Discounts Apply ! This Internal communication solution kit includes:Model 1051 Lighted Keypad Intercom, the Aiphone LEF3L Station Intercom, Aiphone AJ-RY-PA Relay, Altronix 6062 Timer, C2-15-12V2AMP Power Supply and a 42" x 2" Aluminum Heavy Duty Black Powder Coated Pedestal. ASE-KP1000EGRESS Digital Keypad With Delayed Egress Feature & 1000 User Codes Discounts Apply ! ASE-KP250WPVR Access Control Indoor / Outdoor Keypad With 250 User Codes Discounts Apply ! EMX KPX 100 Weather Resistant & Vandal Resistant Digital Keypad Discounts Apply ! ASE-LA06 English/Spanish Weather-proof Security / CCTV Sign Discounts Apply ! SPANISH / ENGLISH CCTV Warning Sign BLUE/WHITE 11" X 9": "Audio & Video Surveillance On Duty At All Times". LAN60 Token Operated Exit Control Parking System Discounts Apply ! The Lan 60 is a very practical and effective control system which enables a gated entrance or exit to be opened once for each time a coded print token is inserted. LAN60K Marked Token for LAN60 Token Operated Exit Control System - Packs of 50 Tokens Discounts Apply ! The LAN60K is a token for the LAN60 Token operated exit control system. This coded print token is deposited in the token slot provided by the LAN60 machine. Available in multiple quantity packs, 50 minimum. Linear AP-5 Wireless Kit - Linear AP-5 Long Range (500') Wireless Receiver (318 MHz) & Two Linear ACT31B Block Coded 1 Channel Key Ring Transmitters Discounts Apply ! Laundromat Magnetic Lock Kit System With Battery Back-Up (1200 lbs Holding Force) Discounts Apply ! The Laundromat Store Magnetic Lock Kit System With Battery Back-Up is designed to be used in a Laundromat business. This Kit Includes: 1200LB Magnetic Lock, 1 Exit Motion Sensor, 1 Egress / Exit Button, 1 On / Off Permanent Key Switch, 7 Day Timer, 1 Battery Backup Box, 2 Batteries, Switching Control Board, 1 Transformer 16 VAC 40 Amp. Model LZ180 L & Z Bracket Set For Magnetic Lock Model ASE-400GF Discounts Apply ! ASE-LZBRACKET800 Magnetic Lock Bracket Discounts Apply ! L & Z Bracket set for all OUR single and double 800 lb. Holding force magnetic locks. This includes single door magnetic lock model 800-MAGSTLED and double door magnetic lock model 2X800MAGD. Double door magnetic locks require two sets of L & Z Brackets (one set per side). Delayed Egress Module Station FAS MAGDE1 Discounts Apply ! Delayed Egress System With 1200LB Magnetic Lock Discounts Apply ! This delayed egress and magnetic lock combines the very cost effective MAGDE1 Delayed Egress module with a 1200 LB UL listed magnetic lock which allows for delayed egress operation. The micro-controller based unit will provide an effective means of locking an exit door while still providing egress during an emergency. Delayed Egress System With 600 lb. Holding Force Magnetic Lock Discounts Apply ! This delayed egress kit combines the very well priced MAGDE1 Delayed Egress module with a 600 LB UL listed magnetic lock and allows for delayed egress operation. The micro-controller based unit will provide an effective means of locking an exit door while still providing egress during an emergency. Model MiniZ082 Z Bracket Set Discounts Apply ! Model MiniZ082 Z Bracket Set For Our H8TMINIMAG Miniature Magnetic Lock. Model MR-1824 Medium-Range MR Reader Discounts Apply ! The Medium-Range MR1824 reader stands out among its competitors for mid-range proximity readers. The MR-1824 is in a class of its own with an industry best 18-24 inches in a compact 8 x 8 x 1 inch enclosure. MX103 Stand Type Alarm Sign. Aluminum Stake Included Discounts Apply ! ENGLISH ALARM SIGN -- PROTECTED BY ELECTRONIC AUTOMATIC ALARM SYSTEM. MX202 English CCTV Plastic Weather-proof CCTV Sign Discounts Apply ! ENGLISH CCTV Warning Sign RED/WHITE-- NOTICE 24 Hour Recorded Surveillance Closed Circuit Television..
MX203 English Plastic Weather-proof CCTV Sign Discounts Apply ! ENGLISH CCTV Warning Sign RED/WHITE 10.5"X 10.5" : "Closed Circuit Television On Premises"
MX204 English Plastic Warning CCTV / Surveillance Sign Discounts Apply ! ENGLISH CCTV Warning Sign RED/WHITE -- WARNING All activities are recorded to aid in the prosecution of any crime committed against this facility. MX204D CCTV Warning Decal Discounts Apply ! ENGLISH CCTV Warning DECAL RED/WHITE/BLACK -- WARNING All activities are recorded to aid in the prosecution of any crime committed against this facility. MX202S Spanish CCTV Plastic Weather-proof CCTV Sign Discounts Apply ! SPANISH CCTV Warning Sign RED/WHITE -- NOTICE 24 Hour Recorded Surveillance Closed Circuit Television. ASE-N-FRF7 Fingerprint Access Controller Discounts Apply ! ASE-N-FRF8 Fingerprint Access Controller Discounts Apply ! Model PAM2 Normally Open & Normally Closed Relay Discounts Apply ! The PAM2 NO / NC Relay provides 7.0 Amp form C contacts. The relay may be energized by one of two input voltages: 12VDC or 24VDC. Complete Wireless Entry Pawn Shop Magnetic Lock Kit Discounts Apply ! FAS PB038A Request To Exit Button Discounts Apply ! FAS PB038B Requst To Exit Button Discounts Apply ! FAS PB038D Large Green Illuminated Button Request To Exit Button Discounts Apply ! FAS PB071C Touch Sensitive Request To Exit Button Discounts Apply ! FAS PB071D Illuminated Green Request To Exit Button Discounts Apply ! FAS PB10 Illuminated Green Square Request to Exit Push Button Discounts Apply ! FAS PB160L Lighted Push Button Discounts Apply ! FAS PB21KG Illuminated Green Round Push Button Discounts Apply ! Button - Large Green Illuminated Push Button with Gang Box (FAS PB23) Discounts Apply ! FAS PBM100 Press To Exit Button With Large Green Button & Gang Box Discounts Apply ! Button - Three Button Station For Access Control (FAS PBU3) Discounts Apply ! Model PEDESTAL 42" x 2" Aluminum Heavy Duty Pedestal Black Powder Coated Discounts Apply ! ASE-PG-500 Fail Safe / Secure Adjustable Electric Strike Discounts Apply ! FAS PGBUTTON03G Narrow Heavy Duty Plate Push To Open Button Discounts Apply ! FAS PGBUTTON05G Heavy Duty Plate Push To Open Button Discounts Apply ! ASE-PG-PCL100 Cabinet Lock Discounts Apply ! PHOTOBRACKET – black Photobeam w/ bracket 30FT AC/DC Discounts Apply ! Photo Eye / Photo Beam safety sensor, 30 Foot Range AC / DC 12 - 250 V, water proof. Includes Reflector, Bracket, and Cover. Applications: Gateopener, Overhead door, Swing gate, Slide gate, parking lot. Photo Eye Reflector (Reflector ONLY) Discounts Apply ! Photo Eye Reflector (Reflector ONLY) for use with photo beams, photoelectric safety sensors or photo eyes. PUSHBAR36" Exit Device For Use With Our Magnetic Locks Discounts Apply ! PUSHBAR42" Exit Device For Use With Our Magnetic Locks Discounts Apply ! Single Channel Long Range Receiver Discounts Apply ! Model R1 Single Channel Long Range Receiver For Up To 1500 Feet. For use with model T1 transmitter. Red Light Indicator with Hood Discounts Apply ! RETAILSTOREMLK1200 Retail Store Single Door Electric Magnetic Lock Access Kit Discounts Apply ! Model RFDIALER200 Automatic Dialer For Alerting You Of Left Open Doors & Gates. Discounts Apply ! This unique device will call you and let you know if your door or gate is left opened. Door contact switch included! ASE-SB-01SF 125 KHz Metal Fingerprint Access Control/Reader Discounts Apply ! SD35 Covert Smoke Detector Camera Discounts Apply ! SD35 Smoke Detector CCD Color Camera with pinhole 3.7mm cone shaped lens. Single Door Gas Station Magnetic Lock Kit System With 1200 lbs Holding Force & Back-Up Battery Discounts Apply ! The Single Door Gas Station Magnetic Lock Kit System With Battery Back-Up is designed and integrated to be used as a complete access control solution for a Gas Station. This Kit Includes: 1200LB Magnetic Lock, 1 Magnetic Lock Buzzer, 1 On / Off Permanent Key Switch, 1 Long Range Wireless Receiver, 2 Remotes, 1 Antenna, 1 Battery Backup Box, 2 Batteries, Switching Control Board, 1 Transformer 16 VAC 40 Amp. Estimated Range is 150'+ line of sight. SOSII Siren Sensor Yelp Mode Discounts Apply ! Siren Sensor for Fire/Police/EMS/911 responders, open motorized gates with Siren's "yelp" in 2.5 seconds (all sirens in 4.5), hands free............... No codes to remember or keys to lose. A reminder decal on gate tells responder to hold siren on for swift entry. Mandate that your gated communities be uniformly 911 "respondable". Thousands now in use and compatible with all gate operators. Protects property, loved ones. Pass the good word. Homeowners who are gone when the fire breaks out will be glad you did. SecuraKey ACPE LE Control Panel with SK-NET Software Kit Discounts Apply ! This kit includes the Securakey's SK-ACPE-LE (SK-ACPE-LE) Access Control Panel Unit and the SK-NET Basic software (SK-NET-DMCD). FAS SS-INFRAREDPB Door Exit Button with Infrared Induction (NO TOUCH PUSH BUTTON) Discounts Apply ! SS-TS2000 Stand Alone Water Proof Proximity Keypad & WG26 Keypad Discounts Apply ! SS-TS2000 Stand Alone Water Proof Proximity Keypad & WG26 Keypad & 10 Key Fobs Discounts Apply ! The unit is single door multifunction standalone access controller or a Wiegand output keypad or card reader with 10 key fobs. It is suitable for mounting either indoor or outdoor in harsh environments. It is housed in a strong, sturdy and vandal proof Zinc Alloy electroplated case which is available in either a bright silver or matt silver finish. The electronics are fully potted so the unit is waterproof and conforms to IP68. This unit supports up to 2000 users in either a Card, 4 digit PIN, or a Card + PIN option. The inbuilt card reader supports 125KHZ EM cards,13.56MHz Mifare cards. The unit has many extra features including lock output current short circuit protection, Wiegand output , and a backlit keypad. These features make the unit an ideal choice for door access not only for small shops and domestic households but also for commercial and industrial applications such as factories, warehouses, laboratories, banks and prisons. SS-TS2000 Stand Alone Water Proof Proximity Keypad & WG26 Keypad & 10 Proximity Cards Discounts Apply ! The unit is single door multifunction standalone access controller or a Wiegand output keypad or card reader with 10 proximity cards. It is suitable for mounting either indoor or outdoor in harsh environments. It is housed in a strong, sturdy and vandal proof Zinc Alloy electroplated case which is available in either a bright silver or matt silver finish. The electronics are fully potted so the unit is waterproof and conforms to IP68. This unit supports up to 2000 users in either a Card, 4 digit PIN, or a Card + PIN option. The inbuilt card reader supports 125KHZ EM cards,13.56MHz Mifare cards. The unit has many extra features including lock output current short circuit protection, Wiegand output , and a backlit keypad. These features make the unit an ideal choice for door access not only for small shops and domestic households but also for commercial and industrial applications such as factories, warehouses, laboratories, banks and prisons. Model TS-433RECTSHIV Wireless 2 Channel Long Range Receiver 433Mhz Discounts Apply ! Model TS-433RECTSHIV Wireless 2 Channel Long Range Receiver 433Mhz includes Antenna. Estimated range 150'+ Line of Sight. 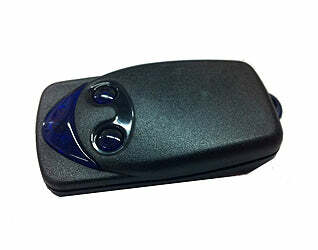 Model TS-433TSD21K 1 Channel Mini Key Chain Remote Control Transmitter 433Mhz Discounts Apply ! Model TS-433TSD21K 1 Channel, 1 Button Mini Keychain Remote Control Transmitter 433MHz. Extra Remote For Model TSFAKIT433-1K Wireless 2 channel long range receiver kit with an estimated range of 150'+ line of sight. Stand Alone 85 Memory 2 Channel Long Range Receiver Discounts Apply ! Stand Alone 85 Memory 2 Channel Long Range Receiver for with 1200 ft range. 433Mhz. Long Range Wireless Keypad & Receiver Kit Discounts Apply ! Wireless Kit Model TSFASKIT433-1K Includes A Long Range (433 MHz) Receiver (150'+ Range) With Two 1 Channel Mini Keychain Transmitters Discounts Apply ! Model UL1200LSDM Surface Mount UL Listed Single Door Magnetic Lock with 1200 lbs. Holding Force Discounts Apply ! Model 1200LSDM is a surface mount maglock with 1200 lbs holding force for single doors. Features delay, LED, lock sensor, built in spike suppressor, and is UL listed and CE approved. All Magnetic Locks Include Manual, Armature Plate & Mounting Hardware For Basic Out-swing Applications. Model UL2X1200LSDM Surface Mount UL Listed Double Door Magnetic Lock (Total Holding Force 2400 lbs. / 1200 lbs. Per Door) Discounts Apply ! This is a UL listed double door 1200lb holding force (each door) magnetic lock. It surface mounts for use with double doors. Features monitoring, delay, LED, lock sensor, spike suppressor, and is UL listed and CE approved. All Magnetic Locks Include Manual, Armature Plate & Mounting Hardware For Basic Out-swing Applications. Model UL2X600LSDM Surface Mount UL Listed Double Door Magnetic Lock (Total Holding Force 1200 lbs. / 600 lbs. Per Door) Discounts Apply ! This is a double door 600lb holding force (each door) magnetic lock. This lock features delay, monitoring, LED, lock sensor, spike suppressor, and is CE approved and UL listed. All Magnetic Locks Include Manual, Armature Plate & Mounting Hardware For Basic Out-swing Applications. Model UL600LSDM Surface Mount UL Listed Magnetic Lock with 600 lbs. Holding Force Discounts Apply ! Model 600LSDM magnetic lock is a surface mountable magnetic lock for single doors with 600 lbs of holding force. Magnetic Lock Features include door monitoring, LED, lock sensor, built in spike suppressor, and is UL listed and CE approved. All Magnetic Locks Include Manual, Armature Plate & Mounting Hardware For Basic Out-swing Applications. Model ULM600LSD Mortise Mount Indoor Magnetic Lock With 600 lbs. Holding Force Discounts Apply ! This 600lb. mortise mount magnetic lock comes from our highest quality line of magnetic locks. This indoor magnetic lock with 600 lbs of holding force. For single door applications. This lock is CE approved and UL listed with built in delay timer, lock sensor and built in surge suppressor. Includes armature plate and mounting hardware for basic. All Magnetic Locks Include Manual, Armature Plate & Mounting Hardware For Basic Out-swing Applications. L & Z Bracket W250LZ For Model W600 Magnetic Lock With 600 lb. Holding Force Discounts Apply ! L & Z Bracket W266LZ For Model W1200 Magnetic Lock With 1200 lb. Holding Force Discounts Apply ! Model W600 - Surface Mount Indoor Magnetic Lock With 600 lb. Holding Force Discounts Apply ! Pedestal - 42" White Gooseneck Pedestal (Model PEDWHT42) Discounts Apply ! Model PEDWHT42 Gooseneck Pedestal 42" Height For Automobiles. Weather-proof Powder coated White. AVI-9945466 uPass Reach UHF Long Range Reader Discounts Apply ! The uPASS Reach offers long range vehicle identification up to 5 meters [16 ft] using the latest UHF technology. Based on battery-free, passive technology, the uPASS Reach reader is a cost effective and enduring solution for parking access. The uPASS Reach reader is designed for parking access in residential and commercial applications such as: gated communities, condominiums, car parks and employee parking. AWID LR-2000 Sentinel-Prox Extra Long Range Reader Without Installation Kit Discounts Apply ! AWID LR-2000 Installation Kit Discounts Apply ! The LR-2000KIT is the mandatory test & setup Kit required to successfully install the AWID LR-2000 parking access reader. All install kits include the following in its own ruggedized carrying case. AWID LR-2000 Sentinel-Prox Extra Long Range Reader With Installation Kit Discounts Apply ! The AWID LR-2000 Sentinel-Prox Long-Range Reader with installation kit is a UHF RFID reader with an integrated fine-tuned antenna. The LR-2000 is optimally designed for Automatic Vehicle Identification (AVI) and Access Control applications such as parking entry and gate control. This LR-2000 Reader system also provides security-sensitive AWID proprietary encrypted vehicle UHF tags in a variety of types and styles. AWID LR-2000 Sentinel-Prox Extra Long Range Reader With LR-TEK Kit Discounts Apply ! AWID LR-TEK UHF Kit Discounts Apply ! AWID SP-6820 Sentinal Proximity Reader Discounts Apply ! AWID SP-6820 is similar to the KP-6840, without the integrated keypad. It mounts on a single gang electrical box and is weatherproof. Has a 6" - 8" read range. RS-232 and wiegand outputs. AWID SR-2400 Sentinel Proximity Reader Discounts Apply ! AWID SR-2400 reader is AWIDs latest engineering achievement with a respectable read range of 4-5.5 inches. AWID WS-UHF-O-U UHF Windshield Adhesive Tags For LR-2000 (50 Cards) Discounts Apply ! Windshield Tag for Vehicles Smaller Than a Business Card Circuit Printed on Flexible, Clear Plastic Semi-Permanent Adhesive Backing Attaches Inside Windshield for Long-Range Reading True Hands-Free Access Control For use with AWID's LR-2000 Long-Range Reader exclusively. Pack of 50 cards. BC452 Bollard Cover 4.5" x 52" Discounts Apply ! Post Guard bollard covers / post sleeves are made from high density plastic. Bollard covers fit over existing posts to protect both vehicles and structures from expensive damage in parking facilities. Save time and money by eliminating constant scraping and repainting! BC464 Bollard Cover 4.5" x 64" Discounts Apply ! The bollard covers / post sleeves are made from high density plastic. Bollard covers fit over existing posts to protect both vehicles and structures from expensive damage in parking facilities. Save time and money by eliminating constant scraping and repainting! BC760 Bollard Cover 7" x 60" Discounts Apply ! BFT AEL-433 Antenna Discounts Apply ! BFT BTBAT Battery Back Up Kit For Phobos Kit Discounts Apply ! BFT CLONIX 2/2048 - D111664 - Two channel receiver Discounts Apply ! BFT CLONIX 2 - D111662 - Two channel receiver Discounts Apply ! BFT QSCD UL Replacement Control Board D111754 00001 For Deimos Slide Gate Operators Discounts Apply ! Replaced by model BFT-I10005410001. We will ship the new model. BFT QSCD UL Replacement Control Board D111754 00001 For Deimos Slide Gate Operators. BFT External Receiver CLONIX 2E 128 codes - D113674 00001 Discounts Apply ! BFT Libra UL-R Replacement Control Board D113701 00001 For Phobos Swing Gate Operators Discounts Apply ! BFT Libra-UL-Replacement Control Board D113701 00001 For Phobos Swing Gate Operators. BFT D831050 Warning Sign Discounts Apply ! BFT DCW Photocell Safety Sensor Discounts Apply ! The BFT DCW is a safety solution for sliding gates. Has an internal rotating lens so installation can be adjusted 180 degrees to solve alignment problems. Wires on one side. Range up to 49 ft. makes it suitable for any sliding gate. BFT D571331 - Pinion Z18 For BFT Deimos Discounts Apply ! The pinion Z18 is the accessory larger sized pinion to be fitted to the Deimons sliding gate automation to increase the sliding speeds to 10.6 m/min. BFT P111376 - SCS1 Serial Connection Interface for BFT Deimos Discounts Apply ! BFT SCS1 Serial connection interface for BFT Deimos. Connecting two Deimos to work together as a master/slave on the same transmitter requires the installation of a serial connection board on both operators. BFT FL130 PhotoCell Discounts Apply ! The BFT FL130 PhotoCells are a pair of photocells with a double relay, normally energized on exit. Typically mounted on flat surfaces, parallel to each other, that are 40 to 60cm from the ground. Range is 30 ft. or less. BFT Michelangelo 60 230V Barrier Arm Gate Operator Discounts Apply ! The Michelangelo 60 has an 18 ft boom. Comes with a BFT barrier gate operator (also known as a BFT barrier gate opener) Libra C MV control panel. Open or closing time is 6 seconds. For very heavy duty use.30V Barrier Arm Gate Operator. BFT TBOX Wireless Radio Digital Keypad (P121019) Discounts Apply ! This Model Is Discontinued. Please see BFT Q-Box as a possible replacement. The TBOX Remote radio control digital keypad for outdoor use, featuring a back-lit light-touch keypad. Compatible with all BFT receivers. 300 ft. Range. BFT Passy Monodirectional Antenna Discounts Apply ! Omni-directional 2,45 GHz antenna. In conjunction with BFT PASSY TRANSPONDER it activates the automated gate when the user is located inside the triggering zone created by the antenna. For hands-free operation of the gate either on opening or on closing. BFT Passy Omnidirectional Antenna Discounts Apply ! Omni-directional 2,45 GHz antenna. In conjunction with BFT PASSY TRANSPONDER it activates the automated gate when the user is located inside the triggering zone created by the antenna. For hands-free operation of the gate both on opening and closing. BFT Predator Wifi Video Intercom Discounts Apply ! Simple setup by mobile phone. Connect to the system video directly through your phone's or tablet's wifi, enter the pass code for the home hub wifi and your devices are connected. View the gate/door any time with monitoring mode! Open gates with your phone / tablet. BFT Q-Box Backlit Digital Wireless Keypad (P121024) Discounts Apply ! The BFT P121024 Q-Box is a digital wireless keypad with 10 channels that can store 100 4-7 digit entry codes to access a property. BFT SBBAT Battery Back-Up Kit Discounts Apply ! Boon Edam / Tomsed Space Saving Double Gate Turnstile THT100TC Discounts Apply ! Designed to combine the functions of two single rotor turnstiles into one turnstile. Boon Edam / Tomsed Waist High Electrical Turnstile TUT50R Discounts Apply ! This Item Is Discontinued. Please see model FAS-TRIL100 as a possible alternative. Universal entry-guard registering turnstile designed for admissions and crowd control. Counts persons passing through. One or two-way operation. Includes platform and railing. Boon Edam / Tomsed Full Height Anodized Aluminum Turnstile THT100STG2 Discounts Apply ! THT-100ASTG2 Full Height Single Rotor Electric Security Turnstile Designed to provide access control to unsupervised applications. Rugged construction ensures trouble-free performance and durability. This models' heavy duty mechanism can be mechanical or self-centering and electrically operated. A second set of electrical controls can be added for exit. Any combination of fail-lock or fail-safe is available. Turnstile can be fabricated from choice of anodized aluminum, precio base (THT-100ASTG2). Boon Edam / Tomsed Full Height Turnstile THT100CSTG2 Anodized Aluminum with Polycarbonated Arms Discounts Apply ! THT-100ASTG2 Full Height Single Rotor Electric Security Turnstile Designed to provide access control to unsupervised applications. Rugged construction ensures trouble-free performance and durability. This models' heavy duty mechanism can be mechanical or self-centering and electrically operated. A second set of electrical controls can be added for exit. Any combination of fail-lock or fail-safe is available. Turnstile can be fabricated from choice of anodized aluminum with polycarbonate arms (THT-100ASTG2). Boon Edam / Tomsed Turnstile THT100EA2 Anodized Aluminum with Stainless Steel Arms Discounts Apply ! Boon Edam / Tomsed Full Height Single Rotor Electric Turnstile THT-100EC Discounts Apply ! THT-100EC is a one way turnstile unit that can be card in OR card out with the opposite direction open only or closed only. Please note that a one way unit cannot be configured the same as a two way unit if the operation changes to a two application in the future. Boon Edam / Tomsed THT100EC2 Galvanized Full Height Turnstile Discounts Apply ! THT-100EC2 Full Height two way unit that can be card in AND card out or configured the same as a one way unit. Boon Edam / Tomsed THT100ECP2 Turnstile Power Coated Steel Discounts Apply ! Our full height turnstile product range consists of several models that all offer excellent security control and can be installed indoors or outdoors depending on their type. Our full height security turnstiles, suitable for controlling unsupervised areas, are available in a wide range of finishes and configurations to suit almost all buildings and environments. Boon Edam / Tomsed Anodized Aluminum Full Height Turnstile with Polycarbonated Arms and Stainless Steel Canopy THT100EL2 Discounts Apply ! The THT-100EL2 is a Full Height Turnstile Single Rotor Electric Security Pedestrian Turnstile Designed to provide access control to unsupervised applications. Rugged construction ensures trouble-free performance and durability. This models' heavy duty mechanism can be mechanical or self-centering and electrically operated. A second set of electrical controls can be added for exit. Any combination of fail-lock or fail-safe is available. Full Height Pedestrian Turnstiles can be fabricated from choice of , anodized aluminum with polycarbonate arms and stainless steel canopy (for interior application only) (THT-100EL2). Boon Edam / Tomsed Full Height All Stainless Steel Turnstile Single Rotor Electric THT100ES2 Discounts Apply ! THT100ES2 Full Height Single Rotor Electric Security Turnstile Designed to provide access control to unsupervised applications. Rugged construction ensures trouble-free performance and durability. Bosch DS150i Motion Sensor (White) Discounts Apply ! Bosch DS151i Motion Sensor (Black) Discounts Apply ! On/Off Key Switch with .9mm Stainless Steel Face Plate & 2 Tubular Keys, (Part# CAMS70K) Keyswitch Discounts Apply ! 40NP Nickel Plated Chain For Select Gate Operators Discounts Apply ! 40NP Nickel Plated Chain For Select Gate Operators. Chain sold in 10' Length Only. Chamberlain TCG-1 Tricode 1 Channel Receiver Discounts Apply ! Chamberlain TCR-2 Tricode 2 Channel Receiver Discounts Apply ! LiftMaster CSW200 1 HP High Traffic Commercial Swing Gate Operator Model CSW200101UL (2018 UL325 Compliant) Discounts Apply ! Liftmaster CSW200 1/2 HP High Traffic Commercial Swing Gate Operator Model CSW200501UL (2018 UL325 Compliant) Discounts Apply ! Liftmaster CSW24UL Swing Gate Operator Discounts Apply ! Model IdealKit2 Single Family / Office Entry Door Intercom Kit (Surface Mount) Discounts Apply ! Model IDEALKIT5-8253 Two-family (Office) 5 Wires Surface Mounted Kit Discounts Apply ! DTK-120HW Single Circuit Parallel Connection Surge Protector For 110V Gate Motors Discounts Apply ! Digital Watchdog MAX-II 4 Channel DVR Discounts Apply ! Digital Watchdog proudly introduces the next generation of its MAX-II series standalone DVR's utilizing the latest MPEG4 part 10 (H.264) Image Compression technology. Available with 4 channels video, 1 channels of audio and Turbo Live View image transfer these standalone units deliver the most advanced real time video and images available on the market today. Digital Watchdog MAX-II 8 Channel DVR Discounts Apply ! Digital Watchdog proudly introduces the next generation of its MAX-II series standalone DVR's utilizing the latest MPEG4 part 10 (H.264) Image Compression technology. Available 8 channels video, 2 channels of audio and Turbo Live View image transfer these standalone units deliver the most advanced real time video and images available on the market today. Digital Watchdog Starlight V1363TIR Discounts Apply ! Digital Watchdog V1363TIR vandal resistant dome camera ensures excellent color sensitivity and high resolution in both day and night applications. Digital Watchdog Pixim V1365T Discounts Apply ! Digital Watchdog V1365T is a high performance camera which offers exceptional Wide Dynamic Range and sensitivity for harsh lighting environments. Digital Watchdog Omnifocus V1372TIR Discounts Apply ! Digital Watchdog Starlight V3363D Discounts Apply ! Digital Watchdog V3363D is a vandal resistant dome camera that ensures excellent color sensitivity and high resolution in both day and night applications. Direct-View LED Traffic Signal TCL217RAG-226H Discounts Apply ! Doorbell Fon DBF-28NIT Additional Outdoor Station Discounts Apply ! Model DP28BF Doorbell Fon Intercom System (Brass) Discounts Apply ! Doorbell Fon DP-28IM Intercom Add On Module Discounts Apply ! This Model Is Discontinued. See Model DP29SW-IM For A Newer Replacement. The Doorbell Fon DP28IM Intercom Module works in conjunction with the DP28C Doorbell Fon Intercom Controller to allow users to ring the telephones in the home from any other telephone within the home to serve as a local intercom. Doorbell Fon installs using a single pair of wires for power, signalling, control and voice. DoorBell Fon Model DBF-DP28IT (Ivory) Discounts Apply ! DoorBell Fon Door Bell Answering System (Ivory) Model DP-28IT. This amazing product allows you to answer a door or gate from any telephone in your home or business. Model DBF-DP28NTA Awning for Doorfon Intercom Station Discounts Apply ! Model DBF-DP28SF Doorbell Fon Intercom System (Aluminum) Discounts Apply ! Doorbell Fon DP-29SW/IM (Previously DP-28SW) DoorBell Fon Outbound Relay Trigger Controller Discounts Apply ! Doorking 1401-080 Fire Department Box Discounts Apply ! DoorKing Lock Down Handle #1610-010 Discounts Apply ! DoorKing 1610-010 Replacement Lock Down Handle for 1610-086 / 085. Lock Down Handle #1610-012 for #1610-082 Flush Mount Traffic Spikes Discounts Apply ! Lock Down Handle #1610-013 for #1610-083 Flush Mount Traffic Spikes Discounts Apply ! Doorking Flush Mount Spring Loaded Traffic Spikes Model 1610-080 Discounts Apply ! Model 1610-080 Flush Mount Spring Loaded Traffic Spikes are ideal for controlling traffic direction and speed through an access controlled location. The illuminated warning sign is always used with the traffic spikes. Please note that Doorking Traffic Spike model 1610-080 may not always be in stock and lead-time can be up to 10 - 15 business days. If lead-time is an issue, please contact us directly for a more specific delivery date. Flush Mount Weighted Traffic Spikes Model 1610-081 Discounts Apply ! Model 1610-081 Flush Mount Weighted Traffic Spikes are ideal for controlling traffic direction and speed through an access controlled location. The illuminated warning sign is always used with the traffic spikes. Doorking Flush Mount Spring Loaded Traffic Spikes Model 1610-082 with Lock Down Discounts Apply ! Model 1610-082 Flush Mount Spring Loaded Traffic Spikes with Lock Down are ideal for controlling traffic direction and speed through an access controlled location. The illuminated warning sign is always used with the traffic spikes. The Lock Down Feature allows spikes to be locked in the down position allowing the traffic lane to be temporarily used for two-way traffic. Doorking Flush Mount Weighted Traffic Spikes Model 1610-083 with Lock Down Discounts Apply ! Model 1610-083 Flush Mount Weighted Traffic Spikes with Lock Down are ideal for controlling traffic direction and speed through an access controlled location. The illuminated warning sign is always used with the traffic spikes. The Lock Down Feature allows spikes to be locked in the down position allowing the traffic lane to be temporarily used for two-way traffic. Doorking Surface Mount Traffic Spikes Model 1610-085 Discounts Apply ! Doorking Surface Mount Traffic Spikes Model 1610-085 is designed to control traffic direction and speed through a controlled entry location. Traffic spikes are used to enforce one-way lane conditions and speed bumps are used to slow traffic down through a controlled area. Doorking Model 1610-150 Speed Bump Discounts Apply ! The Doorking 1610-150 speed bumps are used to slow traffic down through a controlled area. Doorking Illuminated Warning Sign Model 1615-080 (Green) Discounts Apply ! Warning signs and traffic signals are used with traffic control spikes and auto-spikes to inform drivers that a one way lane condition exist and that proceeding in the wrong direction, or before the spikes are fully retracted, will result in severe tire damage. Warning signs and/or traffic signals should always be used in any traffic control application utilizing traffic control spikes. Please note that the Doorking 1615-080 Illuminated Warning Sign is meant to be used with a Stand Alone traffic spike. Doorking Illuminated Warning Sign Model 1615-081 (Red) Discounts Apply ! Warning signs and traffic signals are used with traffic control spikes and auto-spikes to inform drivers that a one way lane condition exist and that proceeding in the wrong direction, or before the spikes are fully retracted, will result in severe tire damage. Warning signs and/or traffic signals should always be used in any traffic control application utilizing traffic control spikes. Please note that the Doorking 1615-081 Illuminated Warning Sign is meant to be used with the 1603 Auto Spike System. DoorKing 1812-081-SURFACE-MOUNT Single Family Intercom System Surface Mount Discounts Apply ! DoorKing 1812-087-FLUSH-MOUNT Single Family Intercom System Flush Mount Discounts Apply ! Doorking 4702-010 Replacement Board Discounts Apply ! Doorking 4702-010 Replacement Board used for Doorking gate operator models 9050 and 9100. Eagle Diamond E555 Control Board Discounts Apply ! 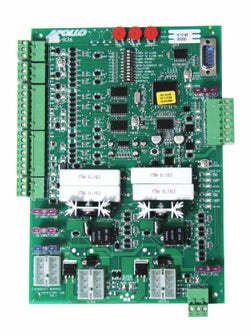 Eagle E555 Diamond Control Board - The unique Diamond board uses state of the art technology combined with ease of use to provide many exceptional new features that cannot be found on any other board. Eagle E-POWER I Battery Back Up System Discounts Apply ! Eagle E-POWER 1 Battery Back Up System for 1/2HP DM MACHINES with 2 35AH BATTERIES. Eagle E-POWER II Battery Back Up System Discounts Apply ! Eagle E-POWER 2 Battery Back Up System for 1HP Operators. EIS Entry 1 GSM Door Entry Unit EIS-1 Discounts Apply ! Simple installation and setup. 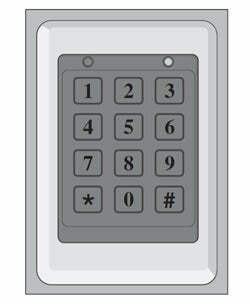 EIS Entry 1 GSM Door Entry Unit gives you easy access up to 1000 caller ID numbers. Supports 3G-GSM wireless carrier. Elite Q240MAU Relay Adapter Discounts Apply ! Elite AH102 UHMV Wheel - 4" V-Groove Wheel Discounts Apply ! Elite AH102 UHMV Wheel - 4" V-Groove hard plastic wheel. Single wheel. 750 lbs. capacity per wheel. Elite AH107 Power Wheel - 4" V-Groove Wheels Discounts Apply ! Elite AH107 Power Wheel - Pair of 4" solid steel, gold zinc plated groove wheels with ball bearings. Weight Capacity: 3,000 lbs. per wheel. Elite AH110 Power Wheel - 6" V-Groove Wheels Discounts Apply ! Elite AH110 Power Wheel - Single 6" solid steel, gold zinc plated groove wheels with ball bearings. Elite AH113 Power Wheel2 - 6" V-Groove Wheels Discounts Apply ! This Model Is Discontinued. Please see model Elite AH110 Power Wheel - 6" V-Groove Wheels as a possible replacement. Elite AH113 Power Wheel2 - Single 6" solid steel, heat treated groove wheels with ball bearings. The Elite AH113 Power Wheel 2 has a bolt size 0.625 x 3.25 with nut sealed bearing. Chamberlain Elite Dial Code Controller Unit Discounts Apply ! Elite Dial Code LC Telephone Entry System Package (DCLCPAC) Discounts Apply ! Elite EL2000 Telephone Entry System Discounts Apply ! Elite EL25 Multi-tenant telephone entry system Discounts Apply ! Elite-ESSWOKSG Wiegand Output Keypad, Essex Discounts Apply ! Elite Icon 26HT1000 Telephone Entry System Package Discounts Apply ! Elite K75-50117 Sprocket and Chain Kit Discounts Apply ! Kit includes: Sprockets and Chain. Elite DC 1000SL Power Back Up System for Old SL3000UL Models. Special Order Item. Elite Powerhinge Discounts Apply ! Elite PowerHinge 2 Discounts Apply ! Elite PowerHinge 3 Discounts Apply ! Elite Power Hinge 3 Industrial Aluminum gate hinges (pair). Elite RFMODKT3 RF Module Kit 315 MHz Discounts Apply ! Elite Solar Panel for use with the Robo Swing and Robo Slide residential gate operators. EMX CS202S-5-100FT Driveway Slim Exit Wand With An 100 Ft Lead - 5 Wire Model Discounts Apply ! The EMX CS202S-5-100FT driveway slim exit wand has a single piece design, making installation easy. The CS202S-5-100FT is designed for many applications, including safety, security access control, and solar applications. 5 Wire version. EMX Infrared Photocell IRB-325 including Hood Discounts Apply ! The Photo Cell Model IRB-325 is an external entrapment protection, device-type B1, non-contact sensor for use with automatic gate operators. The IRB-325 produces a detection signal when the infrared beam is broken. Includes the Hood IRB-325HD. EX-700H expansion monitor station to the HFX-700M video intercom kit Discounts Apply ! The EX-700H is an expansion monitor station to the HFX-700M video intercom kit. FAAC 390 Dual Solar Swing Gate Opener Kit Discounts Apply ! 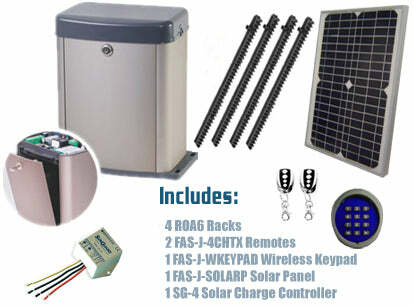 FAAC 390 Solar Swing Gate Opener Kit Discounts Apply ! FAAC 390 Electromechanical Swing Gate Operator 230V Dual Kit Discounts Apply ! FAAC 390 Electromechanical Swing Gate Operator 230V Single Kit 104572.5 Discounts Apply ! FAAC 415 115V Dual Swing Gate Opener Single Kit Discounts Apply ! FAAC 415 115V Swing Gate Opener Single Kit Discounts Apply ! FAAC 415 24V Dual Swing Electromechanical Gate Operator Discounts Apply ! FAAC 415 24V Dual Swing Electromechanical Gate Operator with FREE Weatherproof Keypad RNT-230SADK Discounts Apply ! FAAC 415 24V Dual Solar Swing Electromechanical Gate Operator Discounts Apply ! FAAC 415 24V Electromechanical Operator Single Kit 10441811.5 Discounts Apply !